I've been on a sewing spree! The last 5 days I've been sewing in most of my spare time, and have finished 3 dresses! Enjoy the pictures. I have made quite a few dresses for myself, so I made Jubilee some. I started this dress a few weeks before July, but had to stop as things got busy, and then I left for camp. We finally got what was needed to complete it, and I finished it last Saturday. It's the same as my red rose dress, just made with blue rose material. For an upcoming wedding, with hopefully some old English type dancing afterwards, I made Jubilee a Colonial type dress, like the ones Miriam and I made. 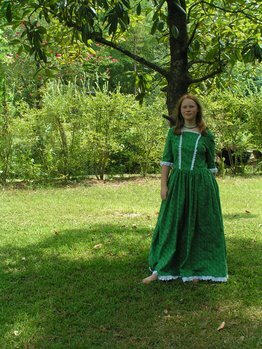 Miriam helped make her sister Esther a dress of the same type in purple, so I made Jubilee's in green. It's really pretty with her red hair and green eyes! I cut it out on Saturday afternoon, and completed it on Tuesday morning. And yes, another for myself! 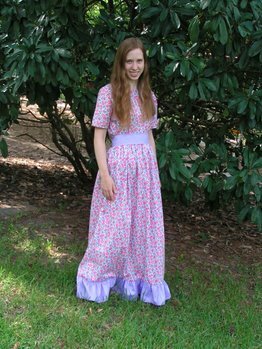 It's the same style as my dark purple-sashed one, only with a light purple ruffle and sash, and pink rosed material. 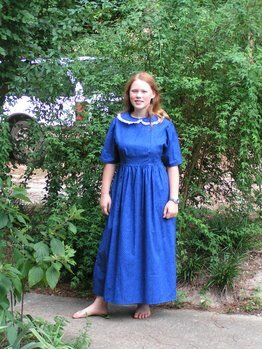 I have had the material ever since I was 13, but never made it into a dress. So, I decided to get it done. I cut it out a few weeks ago, but didn't start sewing until today. I sewed quite a bit, and just finished it after 4 hours of sewing! This is the third time I've used this particular pattern, so it went pretty fast. Another thing that you are soo blessed with: I can't do that either. I wish I could. Did you teach yourself? My mom can't sew too, so that is out as well. All the dresses are beautiful! I really like the blue one in the first picture. What pattern did you use? Just curious. The dresses are gorgeous, Anna! You look very pretty, Jubilee. Thanks for the encouraging comments girls! Anna; will you come sew for me??? Sure Jen! =) Send me the ticket and I'll come... hehe! My name is Laura Hines, and I would like to say, I like your blog. I like to sew too. I have quite a collection of costume patterns, I have accumulated over the years. I have a bin of material, just iching to be used. I have been busy, helping my family with our business. I think we have some things in common. Would like to get to know you more!